More Americans than ever say they’ve smoked marijuana, but for most of them it doesn’t seem to have become a habit. In a recent Pew Research Center survey, 48% of adults said they had tried marijuana, up from 40% just three years ago. 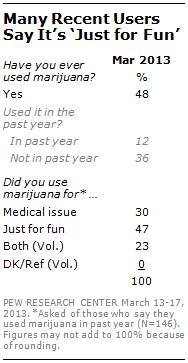 But among that group, just 12% said they had smoked marijuana within the past year. Among that group, marijuana use is primarily recreational: Nearly half (47%) said they smoked “just for fun,” versus 30% who cited a medical issue, while 23% cited both reasons. More than half (56%) of young adults say they’ve tried marijuana, and 27% say they’ve smoked it in the past year — by far the highest percentage in any age category. That’s also the age group showing the strongest support for legalizing the demon weed: 64%, compared with just over half of 30- to 64-year-olds. See a slideshow on changing attitudes about marijuana.